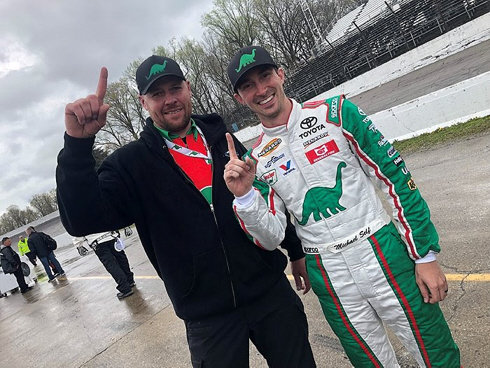 Concord, North Carolina (April 15, 2019) – Michael Self (No.25 Sinclair Oil Toyota) claimed his second consecutive ARCA Menards Series victory in Sunday afternoon’s rain-shortened Kentuckian Ford Dealers 200 at Salem Speedway. Qualifying fourth, Self quickly chased down the leaders taking the top spot away from pole sitter Carson Hocevar on lap-27. From that point Self set sail leaving his competition in his wake until the skies opened up with heavy rain at lap 98. Circling under caution the red flag emerged from the flag stand stopping the race just after the halfway point of the race. After evaluating track conditions and radar, series’ officials made the decision not to restart the race, sending Self back to Victory Lane for the fifth time of his ARCA career. Self’s victory also extended VMS’s 2019 unbeaten streak giving the team its third consecutive victory to start off the young season. In the process, VMS earned their 55th series victory and ninth overall at Salem Speedway. Self led handily over the rest of the field and with a long green flag run to open the race, he had lapped up to the third position. The first caution of the day waved at lap 89 when rookie driver Ty Gibbs spun in turn two. With potential weather off in the distance, there was a decision to be made whether or not to hit pit road. Self’s Venturini Motorsports teammate Chandler Smith (No. 20 Craftsman/828 Logistics Toyota) stayed out to take the lead under the caution, but pitted with one to go. Chandler Smith would finish fourth giving the talented driver his eighth top-5 in just eleven series starts. Harrison Burton, called on just hours before the race to replace championship contender Christian Eckes (No.15 JBL Audio Toyota) after he was unexpectedly sidelined due to medical reasons, finished eighth in his relief effort. The team expects to provide an update on Eckes’ condition early in the week. Next up for the ARCA Series is the General Tire 200 at Talladega Superspeedway on Friday, April 26.